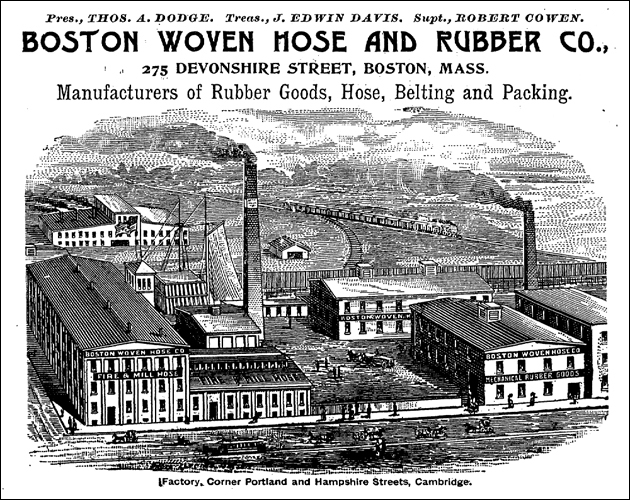 The Boston Woven Hose and Rubber Company was established in Cambridge in 1884 by retired Colonel Theodore A. Dodge and Robert Cowen. The origins of the company, however, can be traced to as far back as 1870. During this early period, inventor Lyman R. Blake designed a “machine for sewing up strips of rubber coated canvas into hydraulic hose” (Stone, 1930, pg. 811). Dodge, who had recently returned to Cambridge and was seeking a business venture, purchased this machine from Blake and began manufacturing the so-called “Blake Hose.” While Dodge’s product was sound and effective, the presence of clearly stitched seams in the hoses created enough skepticism among the buying public to prevent significant sales. In response, Dodge began looking for an alternative machine around which to establish his firm. In 1872, Dodge was approached by James E. Gillespie with a loom that was capable of weaving multiple tubular fabrics. This particular machine was exceptional in that up to this point, it was not possible to weave strong tubular products on flat looms or in the round. Dodge, sensing the importance of the invention, immediately set Gillespie and a newly hired machinist named Robert Cowen to work designing a more practical, streamlined version of the device. Although Gillespie soon dropped out of the effort, Dodge was able to successfully test by 1873 the first ever-manufactured rubber-lined, multiple-woven fire hose for the Boston fire commissioners. Despite a flawless performance, Dodge was unable to persuade fire departments to purchase the hoses produced by the Gillespie-Cowen loom. Dodge persisted in his efforts, with the help of Cowen, for over a decade before finally establishing a legitimate manufacturing concern in 1880. Initially, Dodge and Cowen began production of their hoses in a small section of the Curtis Davis Soap factory with assistance from only two people. During the first year of manufacturing, they produced approximately 15,000 feet of cotton garden hose (Stone, 1930; Gilman, 1896). 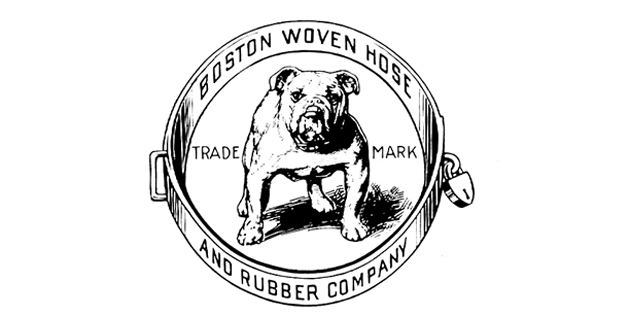 The operation quickly experienced enough financial gain for Dodge and Cowen to form the Boston Woven Hose and Rubber Company in 1884. Soon after this, the firm moved production out of the Curtis Davis factory to an 18,000 square foot plant on Broadway Street, where approximately sixty workers were employed. By 1886, the demand for products had required the company to expand once again. Dodge and Cowen purchased property on Hampshire Street and constructed a large manufacturing complex (Gilman, 1896; Stone, 1930). In 1888, the company was incorporated and by 1896 employed 975 hands and held nearly 250,000 square feet of factory floor space. Throughout this period, the firm expanded production beyond hydraulic hoses to include numerous other rubber products. The most significant of these additional products were hose-pipe and inner tube bicycle tires (Gilman, 1896). By the turn of the century, the company was experiencing enormous success. It was not only engaged in twenty-four hour manufacturing to meet demand, but was also in a nearly constant process of expanding its production capabilities (Gilman, 1896, Stone, 1930). By the advent of the twentieth century, with a financial panic and the collapse in demand for bicycle tires, Boston Woven Hose began to face significant financial challenges. As a consequence, the company was reorganized under new ownership and reoriented around manufacturing products similar to those they had produced in the past. The company had progressively recovered throughout the beginning of the twentieth century. By 1930, the plant consisted of nineteen buildings, including a power house and brass foundry, that covered over fifteen acres of Cambridge. The company employed roughly 1,200 individuals in the production of such products as rubber hoses, rubber rings, rubber fabrics, rubber mats, brass fittings, gaskets, and various tubings. By 1928, the firm was responsible for nine percent of all rubber goods manufactured in the United States (Stone, 1930). The firm continued to survive throughout the first half of the twentieth century; however, with the expansion of modern technology, the company’s processes, buildings, and equipment became increasingly obsolete (Seaburg, 2001). Indeed, as one retired executive of the firm explained, “the efficient plants today…are all on one level, with raw material coming in at one end and flowing through automatically from machine to machine with little or no handling until the finished product comes out the other end. This efficiency is not possible in our older buildings” (Cambridge Historical Society, 1967, pg. 41). By the early 1950s, the company was losing significant amounts of money through ongoing production. Given its precarious future, it was acquired by and merged into the America Biltrite Rubber Company by 1956 (Cambridge Historical Society, 1971; Seaburg, 2001). The Boston Woven Hose & Rubber Company production facilities remained until 1969, when they were destroyed as part of the Kendall Square redevelopment plan (Cambridge Historical Society, 1971).